An avid Trivia Crack player. Photo credit to Emma Bally, ’17. Perhaps our greatest weakness is the Internet. As an avid supporter and producer of procrastination, the Internet is the backbone of all social media, apps, and the majority of modern appliances. The familiar “No Connection” message popping up on cell phone screens is something familiar to us all, and for most, it would cause a sigh or an eye roll. We’ll run to a place with connection just to answer a text or finish a game. We are at the beck and call of the Internet, and with every new app we are pulled in more and more. Many smartphone users experienced full-out addiction when it came to Trivia Crack. People eagerly stared at their phones, waiting for their opponent to spin. “PLAY ME ON TRIVIA CRACK!” students would shout at each other hostilely. The game is essentially Trivial Pursuit, where a wheel is spun with 7 categories: Science, Arts, History, Geography, Sports, Entertainment, and the beloved Crown. Each right answer gets you a point, and every three points you get a chance to win one of six characters by correctly answering a question. If landed on, the crown automatically gives three points and the chance to get the character. If you get six characters before your opponent, you win. It’s a simple concept, so why are people so obsessed if they could have just gone to the SAC to play the board game? One reason is likely the instant gratification of it all. By playing a mobile game with someone next to you, you can insure that your game will be answered. If there is a consistent game going on, you only have to wait about three minutes for your opponent to finish their turn. This is better than waiting for a group of five people to take their turns while sitting at a board game. Trivia Crack made us think we were learning, boosting our egos when we got an answer right. 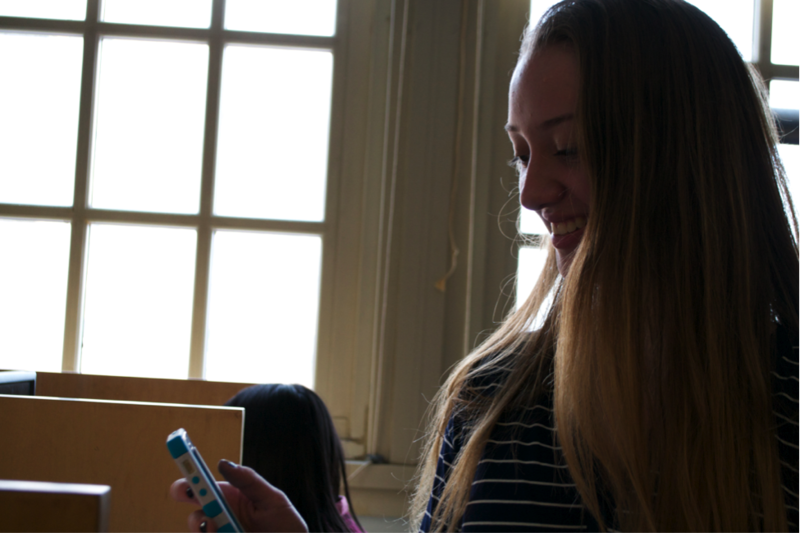 “I felt like I knew an abundance of useless trivia,” shared sophomore Anna Levenberg. It also facilitated teamwork and communication: often people asked others in the room if they knew an answer. Trivia Crack had its peak during Finals Week, and maybe that was its downfall. Although getting science category questions may have constituted as “studying” for some people, others deleted the app as fast as they installed it. Some students found it too time-consuming. On the other hand, Trivia Crack is something that can get boring quickly. If you have no willing participants to play with, you have no game. There is an option to get matched with a random player, but there’s no fun in that. Additionally, it is easy for someone to just stop playing you back. That is the downside to not playing a physical game: it is hard to track what your opponent is doing. Overall, Trivia Crack may have been too much pressure. There is a constant desire for a new game or a turn, with constant notification reminders. Constant notifications have been an issue in the past: too many Facebook invites for Candy Crush put it under the radar out of frustration. In truth, casual gameplay can never be casual if we keep relying on the pressure of others to keep playing. Trivia Crack was fun and still will be every once in a while. However, when one person stops playing, there will be a slow but steady cycle until it’s a forgotten app not worthy of even our home screens. Previous What Are Our New Year’s Resolutions?